Titus Aurelius Fulvua Boionius Arrius Antoninus, known to history as Antoninus Pius, was born of a good family in Nimes locted in the Gallia Narbonensis region (Southern France). Several members of his family had served as consuls of Rome, which enabled him to serve as Quaestor and Praetor before becoming Vir Consularis, a judicial appointment in Umbria and Etruria. 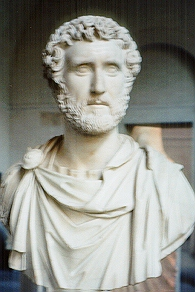 Antoninus served as Consul in 120 AD. Sometime around 133-136 AD, Antoninus served as Proconsul of Asia and it was at this time when he first came to the attention of Emperor Hadrian, who was impressed enough with his abilities that he appointed him to his Conilium Principis (royal counsel). Antoninus married Faustina before his adoption by Hadrian and bore four children during her marraige – two sons and two daughters. Their two sons and one daughter died prior to Antoninius’ adoption leaving one surviving daughter, Faustina, Junior. Following the death of Aelius Caesar, Hadrian was in need of an heir who was both able and childless at this point in time. Antoninus was that man. Hadrian adopted Antoninus on February 25th, 138, one month after the death of Aelius Caesar. During the last months of Hadrian’s reign, Antoninus assumed the role a virtual ruler of the Roman Empire. His succession on July 10th, following Hadrian’s death, was smooth. At the time of Antoninus’s adoption, Hadrian had included a clause whereby Antoninus in turn adopted the young Marcus Aurelius, who Hadrian too special care to insure his brilliant education. The reign of Antoninus Pius was a period of peace and calm. So much so that his reign left little record in history. Antoninus was a good administrator and this is where he focused his attention thus creating an era of prosperity. He did not show any tendency for glory or to expand the Empire for posterity. Instead, he is best remembered for being patient, judicious and impartial. Antoninus was also very tolerant of various religions including the Christians. Antoninus also instituted several regulatory reforms and restored powers to the Senate without relinguishing any imperial powers that would weaken his office. The Senate this gained some administrative authority while Antoninus himself focused also of building projects throughout Italy. It is entirely probable that he never left Italy during his reign. In 140 AD, Faustina, his wife, died. Antoninus was genuinely shakened by this event. He had her consecrated in 141 AD and issued one of the largest commemorative series of coinage in Roman history. He also built the Temple of Faustina in the Forum, which can still be seen today. In areas of foreign policy, Antoninus did not neglect the frontiers. He completed the construction of Hadrian’s wall across Britain in 141 AD. He sought to maintain the defenses of the Empire on all fronts. He also created an Armenian Kingdom as a means of boosting the defenses against Parthia. Antoninus died at Lorium on March 7th, 161 AD. He was succeeded by his adopted son, Marcus Aurelius, as intended by Hadrian’s will. 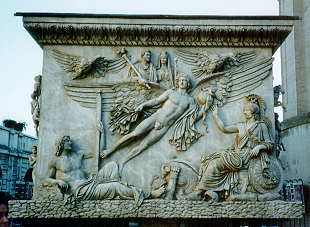 His body was cremated and his ashes placed at rest in Hadrian’s mausoleum. Following his death, a series of commemorative coins were struck in his honor – the largest such issue since the death of Augustus. A spectacular colum was also erected. Unfortunately, all that remains is its based currently on display in Hadrian’s mausoleum known today as the Castle St D’Angelo. Marcus Aurelius married Antonius’ daughter in 145 AD, Faustina, Junior. Originally, Marcus had been married to the daughter of Aelius Caesar. 138 IMP. AVGVSTVS. P.M. PIVS. 139 TR.P. TR.P.II COS.II DES.III. P.P. 143 TR.P.V. – VI. IMP.II. 144 TR.P.VI. – VII. COS.DES.IIII. 145 TR.P.VII. – VIII. COS.IIII. 147 TR.P.VIIII. – X. – XI. Antoninus received the tribunician power on February 25th, 138 AD. The tribunician power was subsequently renewed each year on that date until 147 AD when it was renewed again on December 10th, which subsequently became the normal date for all future renewals His first consulship was in 120 AD. ANTONINVS AVG PIVS P P TR P XI (-XXIIII).